Close your eyes and travel back in time 2,000 years. You’re riding on the back of a camel laden with frankincense and myrrh from faraway Yemen, navigating 100 kilometres across the harsh, hilly Negev Desert to get your precious cargo to the Mediterranean ports. For 700 years, from the third-century BCE until the second-century CE, this was the hazardous but hugely profitable task of the nomadic Nabatean people. Today, the small Israeli portion of the 2,000-kilometre Incense Route – a UNESCO World Heritage Site – is a fascinating trail filled with beautiful desert vistas and archeological discoveries. The route includes the remains of the Nabatean towns of Halutza, Mamshit, Avdat, Shivta and Nitzana (another, Rehovot-Ruhaibe, is hidden by sand dunes), four fortresses (Katzra, Nekarot, Mahmal and Grafon) and two khans (Moa and Saharonim). You can see evidence of surprisingly sophisticated watering holes, agriculture and viniculture that the Nabateans innovated. “The Roman and Greek empires controlled a lot of cities around the Mediterranean shores and, in all these cities, there were pagan shrines where they sacrificed animals. The smell was terrible, so the Nabateans brought incense for those shrines to cover the smell of the slaughter,” explained tour guide Atar Zehavi, whose Israeli Wild tours specialize in off-the-beaten-track jeeping, cycling, hiking and camel-back trips like the Incense Route. Zehavi recommends a two-day “jeeping and sleeping” excursion along the Incense Route, also called the Spice Route. Start in the east, at Moa in the Arava Valley, site of an ancient khan (desert inn). From there, ascend the Katzra mountaintop, a stronghold overlooking the whole region. This will give you an appreciation for how hard it was to lead a caravan of camels up a steep slope. “They’d travel 30 kilometres a day between khans. One camel carried 350 kilos of incense and only needed to drink once every 10 days or so,” said Zehavi, who has a master’s degree in environmental studies. Even back then, camels wouldn’t have had much to drink at the third stop, the Nekarot River, a dry riverbed that once flowed through the Arif mountain range and northern Arava. The Nekarot is part of the Israel National Trail and boasts spectacular landscapes. This leads you past Saharonim to the fourth stop, the town of Mitzpeh Ramon with its world-famous Ramon Crater (Makhtesh Ramon), which still has visible Nabatean milestones among its abundant flora and fauna, including the Nubian ibex. Ramon is the world’s largest erosion crater, stretching 40 kilometres and descending to a depth of 400 metres. It has unique geological structures, such as the Hamansera (Prism) of crystallized sandstones and the Ammonite rock wall embedded with fossils. Camp out overnight in the crater, if weather and traveler preferences permit. A variety of hotels, from desert lodge to hostel to luxury, are also in the crater area. 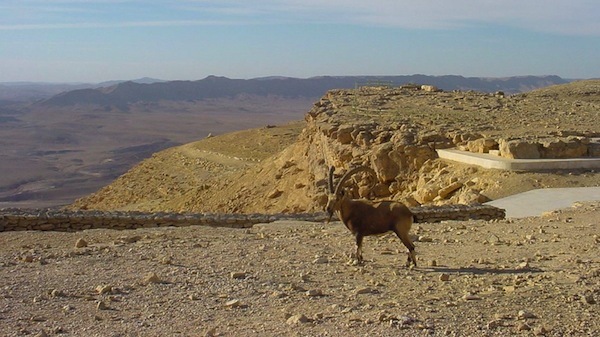 While in Mitzpeh Ramon, you may want to include the visitors centre and a nighttime stargazing tour. Getting back on the Incense Route, you go up Mahmal Ascent on the northern rim of the crater, a 250-to-300-metre climb to the Mahmal Fortress. Proceed northwest from there to Avdat National Park, site of a once-flourishing Nabatean city, where you can see shrines that were later turned into Byzantine churches. 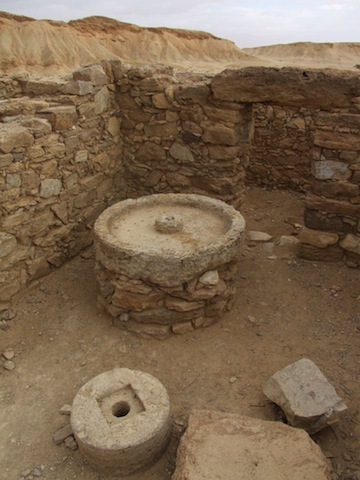 Zehavi explained that, after the Roman Empire transitioned into Byzantine Christianity around 324 CE, incense was no longer needed, so the Nabateans started producing wine and desert agriculture, as well as raising Arabian horses. “It’s amazing to see the way the harsh desert was colonized for agriculture through the use of highly sophisticated irrigation systems,” said Zehavi.